Our Website and Logo Design Process is very personal; tailored to you, your business and the message that you want to convey. Each font, color theme, image, word, etc., is taken into serious consideration and worked until it is a perfect fit for you and your message. We work closely and tirelessly, until we have a perfect fit. Then we stay with you, and keep your site safe and updated on a regular basis, with check-ins, updates and regular meetings. Below are some samples of new and old websites that I have loved working on – from photoshop to code to live on the internet. We guide, educate and work with you every step of the way. We celebrate and present who you are and what you want to convey. Nichols Surf Shop has been providing surf lessons to people of all ages and abilities since the 1980s and has developed a unique teaching routine that takes just two hours, with one hour on land and one in the surf. Working on the art and layout for this website was pure joy, as the water is where my heart is. Nichols also Rents AND Delivers SUPs, Kayaks, Bicycles & Surf Boards to make your play in New Smyrna Beach all the more enjoyable. This website was pure delight to build, as the owners of Nichols are pure delight! You will love working with them. They have also hired Florida Master Naturalists to lead ecotours for visitors and locals alike. Check it out today! YOUTUBE CHANNEL COMING in 2019! Keep in touch. 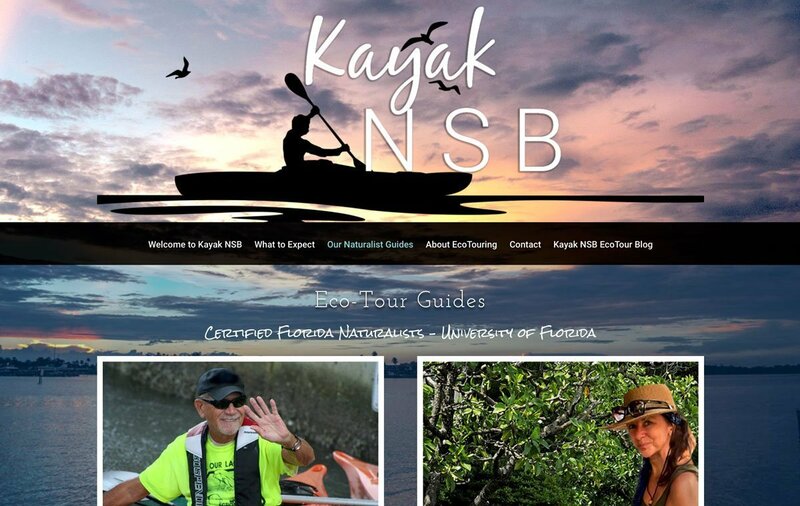 KayakNSB.com was born out of a love of teaching people about the wonders of the environment and the nessesity of caring for that environments … AND! enjoying the outdoors! Come visit, not only the website but the Indian River Lagoon as well. The Center for Optimum Living is a place of transformation. I loved working on this site, as I have grown to love the poeple working there over the years. Sal Benanti, the director, is a healer of the Soul. This was my very first website project and has been rebuilt several times over the years. It is now in the hands of his staff but the design and build is by Lois Reed Designs. Want healing? Give them a visit! as well as use a vestment as the background for the body. The website was originally built in static HTML/CSS with Flash galleries. I recently customized a wordpress theme for her, to match her old site. Now her website works on touch tecnology and is responsive to different screens. Enter and enjoy! Each piece is an amazing work of art! The Marine Discovery Center, Discover Amazing … I have spent many hours giving eco-tours and volunteering for MDC. As a result, building this website was a labor of the heart. With an emphasis on conservation, eco-tours and camps I coined the line Exploration | Conservation | Education to drive the UI (User Interface) of the website. This helped to highlight the key mission of MDC, as well as assisting the visitor in navigating to the sections they are interested in. The images are a combination of photography taken by the MDC staff and stock photography, giving the website a personal touch & showcasing our local beauty. Please take the time to read through the pages and learn about all of the incredible work MDC is doing for the environment! New Smyrna Beach is a “Snow-Bird” town. People are in and out for months at a time. For this reason, having someone to check on your home is essential. Not only for break-ins, but also to keep tabs on termites, wind damage, any leaks or other unexpected issues that can arise in your absense. Property Watch services the North Beach area of the island. You can see from the design that they will greet you with smiles, and handle your home with tenderness. I love working on projects that help to educate people so that we can make this planet a healthy place for all of life. Anyone who has worked with me, or who knows me personally, will understand what a joy it was for me to manage & create this website project. The subject of the health of our planet is near to my heart. Be sure to check out the hundreds of downloads in the “Helpful Documents & Links” section. Lisa Charney is a talented yoga teacher. Joint & Sole is an example of the birthing process that takes place when designing a website, organically. She originally wanted blues and peaches, now she has a quiet, soothing black and white website. Neither of us are certain how we got here, but the overall look and feel of the site is how I feel when practicing yoga … quiet and without distraction. …visit her site and feel for yourself. When I see a website that I love, I look at the ‘source-code’ to check how it was made. Most of the time I find WordPress in the background. But, lately, I have been seeing SquareSpace behind the scenes. I called them and asked a lot of questions about being able to modify it with my own jquery & css. They told me it would not be a problem to do so. Audrey Sloofman (President of Create Exceptional Leaders ) came to me, needing her website up and running for a conference in Switzerland the following week. I saw my opportunity to get my hands dirty with SquareSpace. I was pleasantly surprised. Audrey needed some coaching with the back-end interface, and I was also able to do some customization for her. In the future we will focus on SEO and additional features for the CEL website. But, for this 5 day build, SquareSpace came to the rescue. The Kiwanis Club of Randolph sponsors the annual Morristown CraftMarket. Anita Freeman, a representative from the Kiwanis Club, asked Lois Reed Designs to design a website that would complement their show. Being an artist myself, and having participated in similar shows in past years, I was thrilled to take this project. The quality of the art accepted into the Morristown CraftMarket was a great inspiration when designing the look of the MACM website. Updated responsive design coming in 2019! 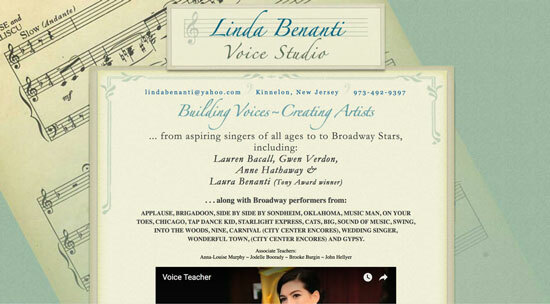 Linda Benanti is a brilliant voice teacher, located in Kinnelon, New Jersey. Not wanting to take time away from her work, she asked only for a presence on the web. We decided to create a 1 page website for her voice studio containing contact information and a bit about Linda herself. The video on the page shows the depths of Linda Benanti’s talent. note: this is an older build, not yet coded for touch technologies. Check back in the future and we will have it updated! David’s website is a perfect example of letting the client’s work design the site, rather than me, the website designer. Every visual element in this website is a piece of David’s artwork. When working with artists, there are times that I have to step back as a designer and simply put their work into XHTML code. note: since the time of this build responsive touch technology has come out and this website has not been updated. I hope to be the announcing an update in the near future! Lois Reed Designs has over 20 years experience designing, maintaining and advising clients with their online presence. Here are just a few examples, some not yet updated for mobile – but loved and showcased anyway. Contact us to see more examples! Call today and see what we can do for you and your online presence.